Construction spending rose 0.4 percent month-over-month from May to June and 4.5 percent year-over-year to a seasonally adjusted annual rate of $1,309.5 billion, according to the latest data released Monday by the U.S. Census Bureau. Spending during the first five months of the year totaled $497.1 billion — 4.3 percent higher than the first five months of 2017. In the private sector, spending was up 0.8 percent for residential construction and down 0.3 percent for nonresidential construction. Especially strong gains were seen in the singe-family construction sector, where spending was up 8.2 percent year-over-year and 0.6 percent month-over-month. Multi-family housing spending climbed 1.6 percent month-over-month and 4.2 percent year-over-year. That increase could be a good sign for an inventory challenged market. 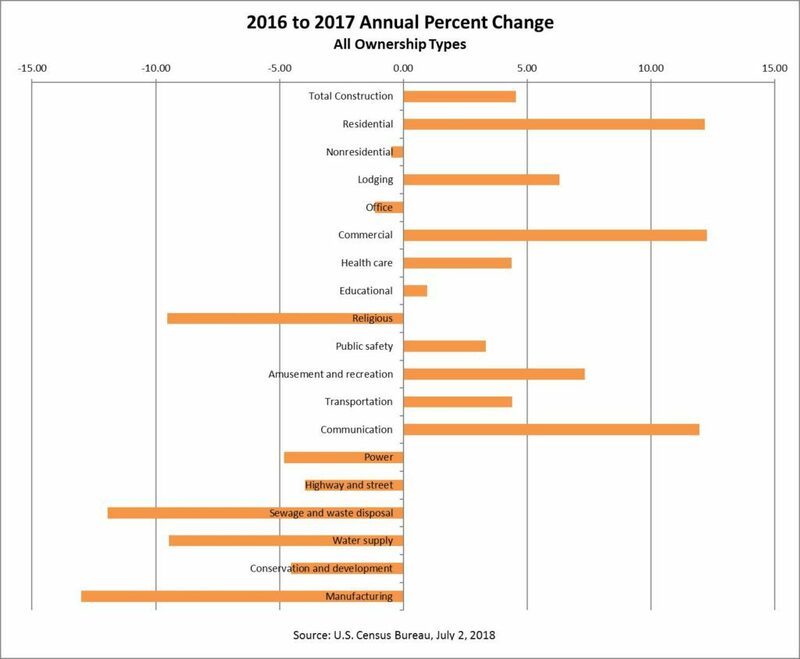 A new chart released today by the U.S. Census Bureau shows the areas where there had been an increase in construction spending from 2016 to 2017. Seasonally adjusted data collected by the agency for construction spending has been revised back to January 2011.